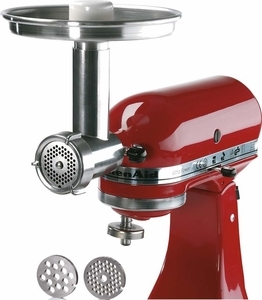 Brand new, Jupiter Products metal food grinder. Fits all KitchenAid stand mixers. It minces and chops meat, vegetables, fruit, and bread, etc., and comes with a 4-winged blade and 3 discs (3, 4, 5 & 8 mm) made of rust-proof stainless steel. German Engineered. Instructions included. NOT dishwasher safe.